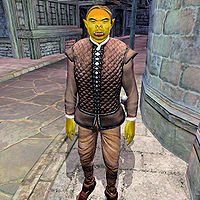 Graklak gro-Buglump is an Orc rogue and a permanent resident at the West Weald Inn in Skingrad. He lives his life at ease and spends most of his time walking around town, enjoying the sights and the company of the Skingrad citizens. He sleeps in the upstairs area of the inn, first room on the left, every night between midnight and 6am. After waking up, he heads downstairs and wanders around a bit, before he finds himself a table and enjoys his breakfast at 8am. At 10am, and if the weather is clear, he leaves and walks around just outside the inn, while chatting with the many townsfolk passing by. At 2pm, he heads for the Two Sisters Lodge and eats a two-hour lunch. At 4pm, regardless of the weather, he once again takes a walk outside, this time in the area near the houses of Salmo, Glarthir and Bernadette Peneles. At 8pm, he once again enters the Two Sisters and enjoys a two-hour dinner. He returns to the West Weald Inn at 10pm and heads upstairs to his bed at midnight. He wields an iron dagger and wears a set of middle-class attire, a quilted doublet with tan linens and doeskin shoes. He carries a small amount of gold. He knows a leveled set of rogue spells. He has no particular greeting, but is more than willing to tell you about Skingrad: "What do people do here? In town, shopkeepers, smiths, priests... the usual. Fighters Guild and Mages Guild. The rest are farmers or herders. Wines are a Skingrad speciality and the Surilie and Tamika Vineyards are famous all over Cyrodiil." His low Responsibility occasionally leads him to try to pickpocket other NPCs in the West Weald Inn. When noticed, he may be attacked by guards and other NPCs, which often leads to his death. An unused rumor suggests that Graklak may have been involved in some sort of betting: "I wouldn't mind making a few bets, but I'm not sure about Graklak. He seems a bit slick to me." Esta página foi modificada pela última vez à(s) 21h54min de 3 de junho de 2015.